You’re thinking “Why the hell is she eating chicken nuggets?! 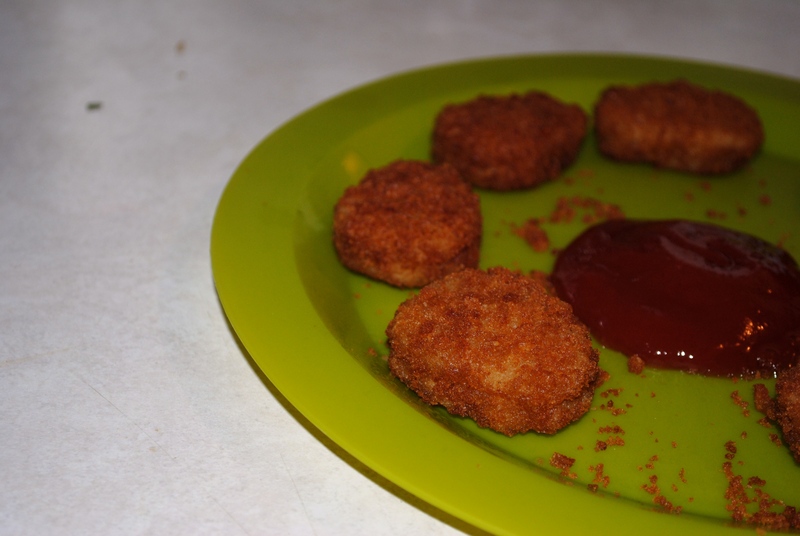 Chicken nuggets are not vegetarian!” And you’d be right in that assumption, except I’m not eating chicken nuggets. No, I’m eating chik’n nuggets, by Morningstar. Fooled you all (well, at least I hope I did!). I saw these scrumptious puppies down in my organic and health food section. To me they taste just like the real thing, they smell a bit different – not in a bad way, just different – but who cares when they’re just as juicy and savory as the real deal? I definitely give them a 4.5 out of 5 stars! They’re super easy to whip up – for eight of them it takes about two minutes in the microwave, and that’s nice if you’ve got a busy day, like I do. Also I asked on Pretzelmaker’s (of PretzelTime depending on where you live) facebook if they had any options for vegan’s or vegetarians. They don’t for vegans, but for vegetarians they have ALL of their pretzels, except the hot dog pretzels. Pretty cool, huh? I think the best part of this ‘diet’ is seeing how much I was already eating like a vegetarian.